We have some great new sets at the studio! The first is an homage to our favourite video games and movies - A post-apocalyptic wasteland. I had the immense pleasure of photographing Lauren Stone, the amazing and talented wife of Travis, a co-writer of Fallout New Vegas. Here She's embodying a nuclear disaster survivor, a pinup fresh out of the vault followed by a seasoned Mad Max inspired Raider. 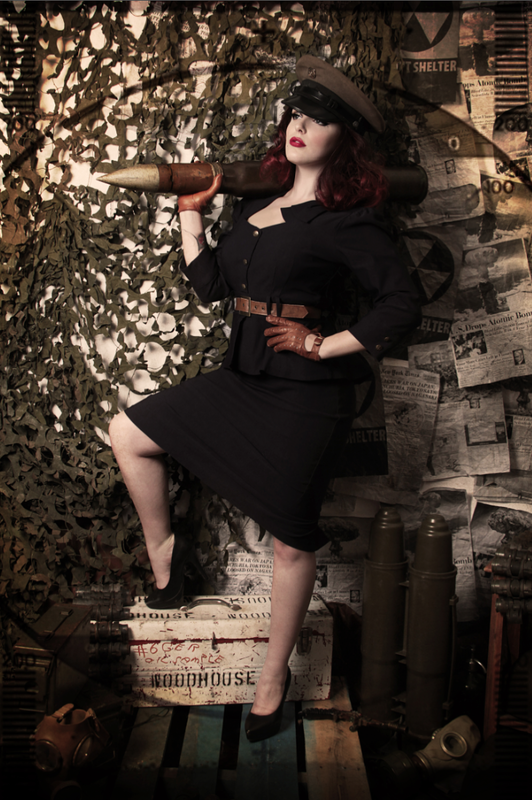 Below we have Audrey Ivory doing a more classic Pinup with a little sass. My Incredible mother was the personal shopper for this set - I wrote a list of items I'd like to have for this homage series and she basically found every little detail, and then some. Some of the accessories include: A machete, Laser guns, Tank Ammo rounds, Missile Carrier, Gas Masks, Ammo Boxes, Helmets, Giant Bullets and more! I've Also been working on a fun pink series - I'm looking forward to a shoot next week with none other than Drag Queen Billy L'Amour!! We're going to twist this decor into an homage to Amanda Lepore - Stay tuned for images! The second image is actually for Montreal's Pinup Academy, which will be hosted at my studio by the lovely Miss Ginger (featured below). The workshop will offer great hair and makeup tutorials, Body Image classes and posing techniques by some pretty amazing montreal ladies including: Lavender May, Audrey Ivory and HellCath! At the end of it all everyone gets a quick photo shoot and options for prints and retouching! Keep up to date! Shows, sets, news and more! Photographer, designer, illustrator and Burlesque Producer in Montreal QC, snapping images since 2001, her style has evolved into a funky & colourful dreamscape. Marisa Builds all her sets from scratch, from concept to execution. Best known for her ability to get ANYONE into that perfect pose that looks so natural and elegant.